Maeslant Barrier in Rotterdam, from The Wall Street Journal, at wsj.com. The Dutch, living on a seacoast, save disappearing land by building protective dikes, and reclaiming marshland for agriculture, and have been doing so for a very long time. In the first century AD, Pliny the Elder described inland farmers constructing dams in tidal creeks to protect their land against high water. Today’s world is also plagued by flooding. Thailand suffered serious inundation in 2011; factories near Bangkok closed, delaying the production of Toyota automobiles whose specialized parts are manufactured in Thailand. Water disasters have impacted New Orleans on the Gulf as well as the farmlands along the Mississippi River. What of island nations disappearing due to rising oceans – the Maldives, Kiribati? Can the medieval Dutch teach us a few lessons for a safer and more productive future? IS IT ALL DUE TO A CAT? During the Middle Ages, cats were introduced to Europe to control the rodent population that had long ravaged stored grains. As a result, agriculture became more efficient and there was throughout Europe a period of growth. The farming opportunities began to appeal to the Dutch who dug up marshes to create farmland. From 800 to 1250 AD due to a boom in farming and a growing coastal trade, the population of the Netherlands grew ten-fold. To keep up with the demand for food, the Dutch dug up the marshes and sold the peat, converting marshes to farmland. But as the marshes were drained, the groundwater was lowered and the land began to sink. It therefore became imperative to build a series of linked major dikes to protect the land from flooding. Previous to this change, the land had been 6.5 to 9.8 feet above sea level (2-3 meters). It is worth noting that while dikes are not unique to The Netherlands, they have provided the country with one undeniable distinction: it constitutes the only country in the world whose key areas were reclaimed from the sea, not from neighbors. Additionally the thousand-year-old dike army can be regarded as an authentic progenitor of the concept of “an army enlisted against nature” as proposed by William James in the essay “The Moral Equivalent of War.” Around the year AD 1100, West-Friesland had built an enclosure dike (omringkijk). At the same time, the Frisians established a “dike peace” or strongly enforced consensus that whenever a dike was endangered, family feuds must cease forthwith so that all available manpower could be mobilized to reinforce the dikes. A statue to the boy who saved Holland. Many children know the story of Hans Brinker, or The Silver Skates, thinking it to be translation of a Dutch book. Hans, a valiant fifteen-year-old boy who skates very well, saves his father’s life and lets his friend win the championship skating race because his buddy needs the prize money even more. But the story, first published in 1865, was written in fact by an American who had never even been to Holland. The book captured the imaginations of many. In addition to introducing the sport of speed skating to the United States, the book was taken up by Disney in films both in 1962 and in 1998, adapted for in-line skating set in Los Angeles. Erroneously, many people think Hans also is the boy who saved Holland by plugging a hole in the dike and staying there all night until adults checked the dikes in the morning and were able to fix the leak. It’s the kind of thing Hans Brinker would indeed have done. But actually this is a sub-story in the Hans Brinker book by Mary Mapes Dodge, who merely refers to the boy as The Hero of Haarlem. Later, Phoebe Cary, an American poet living not too far from an area of New York City that became known as Harlem, wrote a poem called “The Leak in the Dike” in which she named the boy Peter. From the Museum De Lakenhal, at lakenhal.nl. While Hans and Peter dwell in legend, Arie Evegroen is a hero of history, as are Cornelis Heuvelman and Johannes Aart van Vliet. During the North Sea flood of 1953 when over 1,800 people died, Evegroen was asked by the mayor to use his grain barge Twee Gebroeders (Two Brothers) to plug a dike leak in the area of Nieuwerkerk aan den Ussel. Heuvelman volunteered to help hold the barge, roping the ship to the dike so the waves would help to push it into the breach and hold the water back. Soon the Mayor of the town who had summoned Evegroen saw that more was needed, so Mayor Vogelaar next asked Johannes Aart van Vliet to use his barge, Onderneming II, to bring sandbags to the dike. But Van Vliet did more than asked; he also brought hot coffee, and a portable stove so Dike Army volunteers were warm throughout the crisis. Another lesson to be learned from the Dutch is collective governance. Local communities came together to form water boards that had, by common consent, wide powers of inspection, discipline and governance. The aristocracy, which possessed large landholdings, supported the water boards; these local organizations called out the dike army as needed. Water boards were democratic organizations, but slowly received formal charters from the rulers of various districts. In effect, local water boards also produced revenue through self-taxation: each village contributed to the upkeep of their local dikes. What can we learn from the democratic, self-regulating and self-taxing water boards as we consider governance and maintenance of key infrastructure? Is there a role for locals in highway maintenance, canal improvement, bikeway development? Still, the seven provinces had slightly different policies on rivers and water. 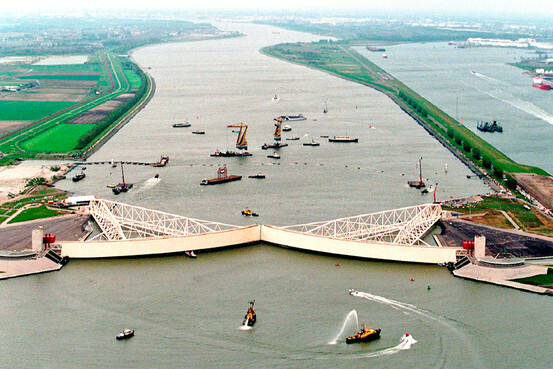 The need for central coordination led, in 1789, to the establishment of a state water authority, the Rijkswaterstaat, to plan and supervise large-scale construction including reclamation of the Zuider Sea. This same effort resulted in the creation of Lake Ijssel, the largest Dutch reservoir, assuring the northern provinces of an ever-normal freshwater supply even during dry periods. Can the success of the Rijkswaterstaat serve as a model for a regionally-applied “ever-normal” water supply? While our world has plenty of water, we still suffer from floods and droughts. What can we learn from the Dutch? In 1282, an unknown Dutch carpenter built the first water-pumping windmill – probably an Arab invention observed by a crusader who later returned home and reported on its design and use. Nearly three centuries later, a windmill with a rotatable top was developed; this was an important improvement because winds in northwest Europe come from different directions, so the new kind of windmill could always take advantage of prevailing winds. Windmills helped engineer artificial drainage in embanked areas called polders. With such innovation, it was now possible to drain large lakes. Unwanted water was dispatched into specially built drainage canals. – A.A. Beekman. Het dijk – en waterschaprecht in Nederland voor 1795. (Gravenhage: Martinus Nijhoff, 1905). English translation by Pieter Huisman. The Water Board shall dig watercourses and construct sluices and bridges in the region. The Board shall develop these works in locations that will be the most adequate and profitable for the region and in such ways that the inhabitants downstream profit equally from these works as will the inhabitants in the upstream region…all people possessing land between the Meuse and the Waal shall stand ready to pay for the cost and the maintenance of the watercourses, sluices, weirs, and bridges according to the ratio of their land ownership…the dijkgraaf will inspect the dikes between the Meuse and the Waal with the same frequency in every village. – H. van Heinigen, Tussen Maas en Waal. (Zutphen: De Walburg Pers, 1972, 440-442. English translation by Pieter Huisman. New Land: As world population increases, there will be more demand for land. Can we use principles and technology using water and wind to preserve our coasts? Boston Harbor and the Back Bay are examples of land reclamation and development. How can Boston, and of course Holland, serve as case studies to recommend similar actions for endangered global coastlines? Can Dutch Docklands lead the way to new floating cities? What sovereignty issues might evolve? Shipping and global ocean environments: Coastal cities such as Amsterdam, The Netherlands; Rio de Janeiro, Brazil; and Lagos, Nigeria prospered due to access to water. So too, Boston. Songdo, a new city in South Korea is a case in point. And would New York be the metropolis it is today without both the Atlantic Ocean and the Erie Canal? What opportunities for economic development await land with access to global waters? What environmental provisions must be considered when planning a safe future for our oceans? “Holland goes beyond holding back the tide: Nation endeavors to be climate-proof,” by Colin Nickerson, The Boston Globe, Monday, December 5, 2005. Correspondence between Pieter Huisman and Frank Davidson detailing contents of four Annex documents regarding the dikes of 1456, 1611, 1500, 2000. Correspondence between Pieter Huisman and Kevin Downing of Greenwood Press regarding photo of storm surge barrier in Rotterdam Waterway in 1997. Digital files (on older formatted floppy disks – may need to be converted). “West-Friesland’s ‘Oud en Nieuw’,” Uitgegeven door het historisch genoot-schap “oud West-Friesland,” ter Drukkerij “West-Friesland” te hoorn in 1936. Text begins: “Het octrooi der bedijking van Burghorn (1456). “Water Legislation in the Netherlands,” by Pieter Huisman, DUP Satellite, 2004. “The Dutch Windmill,” by Frederick Stokhuyzen, former chairman of “De Hollandsche Molen,” Association for the Preservation of Windmills in the Netherlands, publisher CAJ van Dishoek-Bussum-Holland, 1962, translated from the Dutch by Carry Dikshoorn. Pp. 1-17 (of 68). “Shipping Canal at Rijswij,” illustration and description of Dutch landscape painting by Hendrik Weissenbruch. From Rijksmuseum. “Water Mill,” illustration and description of painting of a water mill with three wheels by Jacob van Ruisdael. From Rijksmuseum. “Cattle Ferry,” illustration and description of painting of a Dutch river activity, the first time such a Dutch river landscape was depicted on a monumental scale. Form Rijksmueseum. Various laws concerning flood defense of Rhine and Ussel, and documents concerning the creation of the Rijkswaterstaat on 24thMay, 1789. Fax from TUDelft Water Management, February 15, 2002. “THE NETHERLANDS: Built and Maintained by Engineering,” early draft of chapter by Frank P. Davidson, hand typed. “Planet Earth Renewed: MacroProjects and Geopolitics.” R.B. Cathcart. Excerpt on Holland from unpublished manuscript, circa 1983. “Groundwater Management in the Netherlands: Background and Legislation,” N. P. Pellenbarg. “Water management history in the Netherlands,” excerpt. “Geography of the Netherlands,” IDG Bulletin 1999. Details 1964-1999. “Polders and Dykes of the Netherlands. “Early Medieval and Byzantine Civilization: Constantine to Crusades,” by Kenneth W. Harl. http://www.tulane.edu/~august/H303/handouts/Population.htm. “The Netherlands: Organisation and Management of Water Management,” from Water Management Journal, Year 45, No. 7-8/2002, p. 12. “Heroes of February 1953 Flood finally recognized for saving untold lives,” http://www.godutch.com/newspaper/index.php?id=1525. GoDutch.com, February 09, 2009. For Asia-Pacific Center for Security Studies: www.apcss.org. Litwin, Evan. “Climate Diaspora.” McCormack 2011 Master’s Thesis, UMB. Hans Brinker and the story of the boy who saved Holland, Wikipedia. *“Towns in Germania Inferior: Laurium (Woerden). http://www.livius.org/ga-gh/germania/woerden.html. *Koninkliijk Nederlands Aardrijkskundig Genootschap. http://www.knag.nl. *“Polders and Dykes of the Netherlands: The Reclamation of Land in the Netherlands,” by Matt Rosenberg. Copyright The New York Times Company. About, Inc. http://geography.about.coom/od/specificplacesofinterest/a/dykes.htm. *“The Valour and the Horror in Desparate Battle: Normandy 1944 – Mulberry Harbour,” www.valourandhorror.com/DB/BACK/Mulberry.php. *“Collection Rijksmuseum Amsterdam,” close to one million objects, details of collection summarized. http://www.rijksmuseum.nl/collectie/index.jsp?lang=en. *“Choosing a Cat,” role of cats in grain storage. http://www.isabellevets.co.uk. *“The Moral Equivalent of War,” William James. (whole essay printed here) http://www.constitution.org/wj/meow.htm. *“Impact of Emerging Technologies,” Technology Review, MIT. Building the World Blog by Kathleen Lusk Brooke and Zoe G. Quinn is licensed under a Creative Commons Attribution-NonCommercial-NoDerivs 3.0 Unported License.